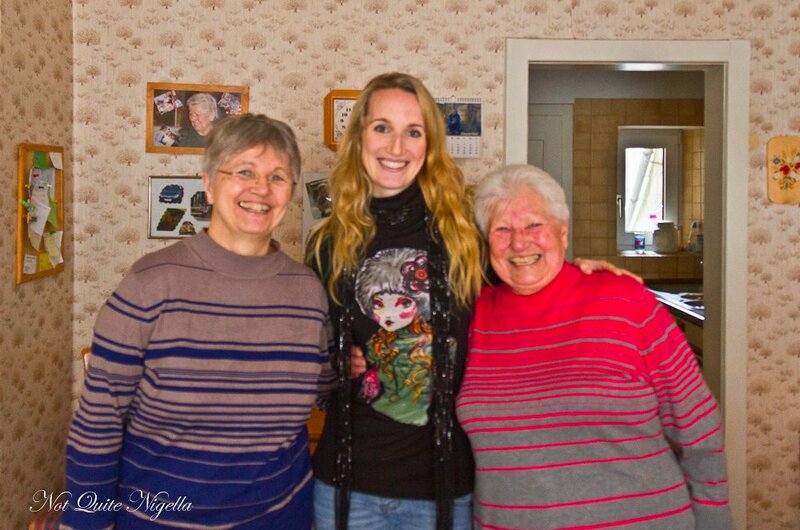 Getting a grandmother's recipe is like receiving a nugget of gold or being the recipient of gleaming treasure. 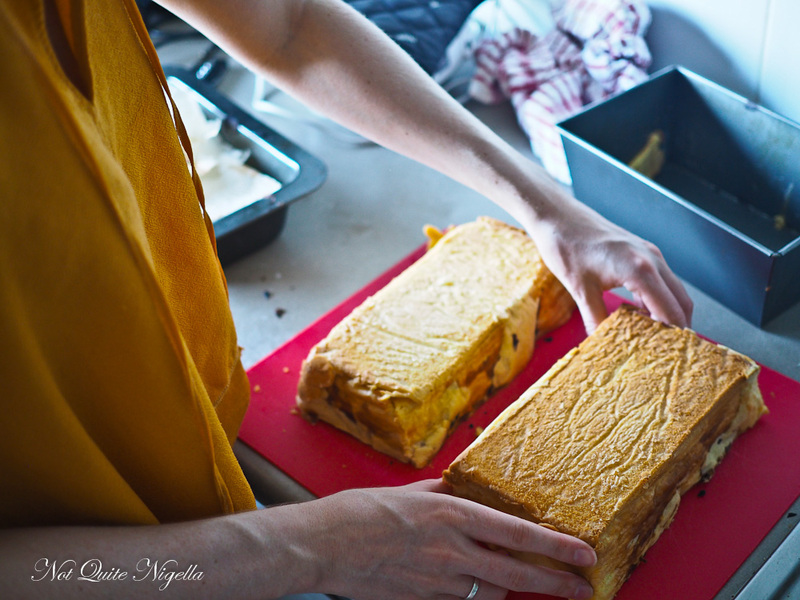 When my friend Lena offered to show me how to make her grandmother Luise's German baumkuchen or tree cake recipe I jumped at the chance to make this wonderful and intriguing cake! I had to call her Lena of course! Baumkuchen is a very interesting cake. The reason why it is called a tree cake is because of the many layers of cake that when sliced through resemble the rings of a tree (the Indonesian Lapis cake is similar looking although not round). Baumkuchen is generally quite expensive and hard to find because it is hard to make and sometimes it is even sold in sections. Usually cake batter is rolled on a rotisserie mold and it is grilled while it turns. This requires a special set up and isn't really feasible for the home cook unless they want to rewire a toasting oven (a task way beyond me!). But don't worry you can still make this gorgeous cake in a loaf tin. 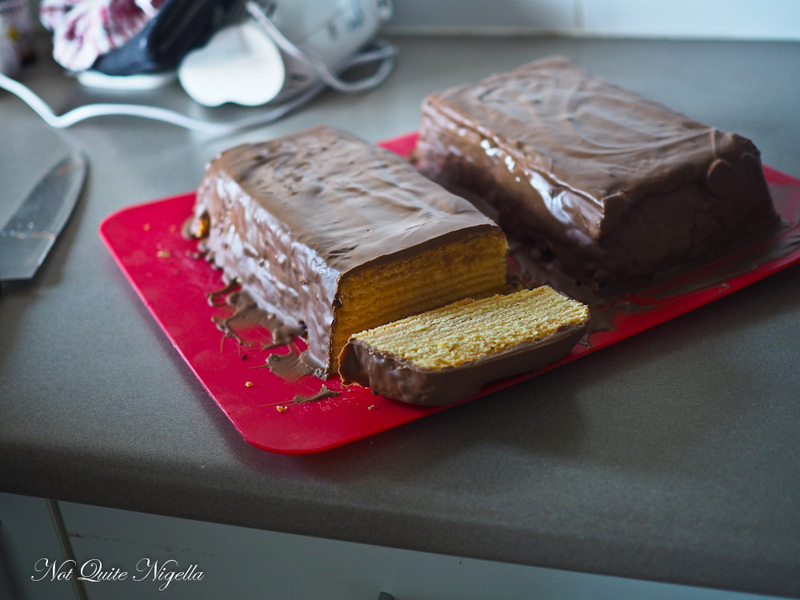 But as Lena said, "Baumkuchen is easy but it does require patience." All of those many layers require individual baking. We set up chairs and played with Mochi in between baking layers. 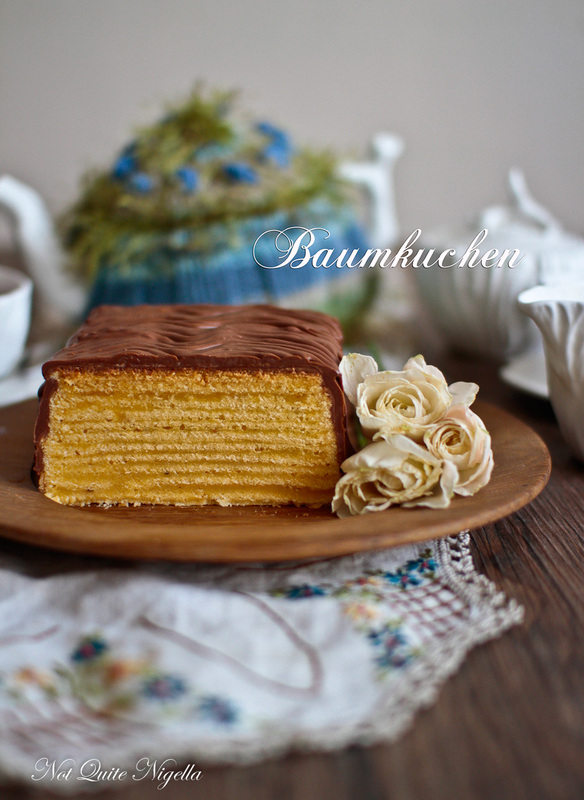 The other reason Baumkucken is interesting is because it improves as times goes on much like the Castella cake. I used to see this cake a lot of Japan (where the castella cake is also popular) where it was brought over by a confectioner Karl Joseph Wilhelm Juchheim. When it is sealed and sits on a shelf I have to say that it is fine but a bit dry. But bake one of these cakes yourself, coat it in chocolate and allow it to sit for a few days in an airtight container in the fridge and the flavour improves and it becomes more moist. That is the best baumkuchen there is. Lena's version differs a little from her grandmother's. 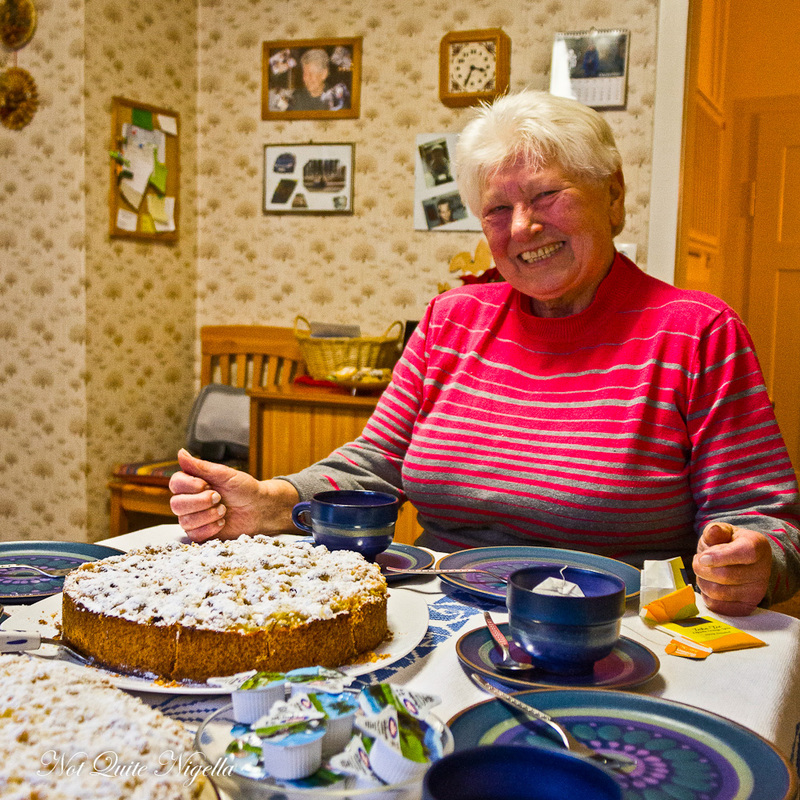 She baked hers in an oven while her grandmother puts it under a grill. The grill is faster and you get a darker contrast between the layers but baking it in the oven doesn't dry it out as much. I actually prefer the oven version. I met Lena on a Thailand trip a few years ago. The whole group made up of journalists, photographers and PRs were so wonderful and we all got on very well. We even developed our own little language or at least a word. I misheard Lena say something. I thought I heard her respond to something fabulous with the word "Atouf!". It was accompanied with a hand gesture and we decided then that whenever we should come across anything (like a dog with eyebrows) it would be deemed "Atouf" which meant fabulously stylish. We tried to get it to become a thing (yes we tried to make fetch happen, it didn't) but it becomes a little greeting whenever we see each other. And now we have a tree cake too! Totally atouf! So tell me Dear Reader, do you make up code words or a language with friends or family? 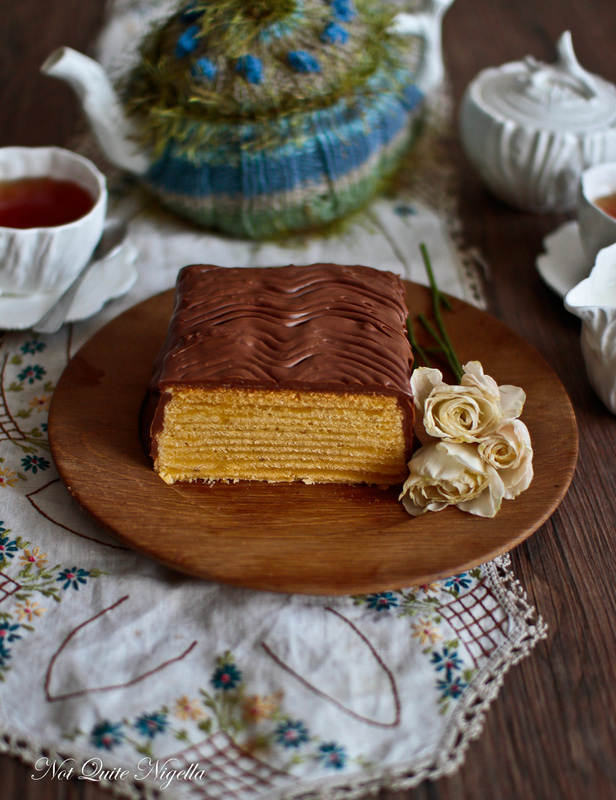 Have you ever tried baumkuchen or tree cake? Would you have the patience to make this cake? 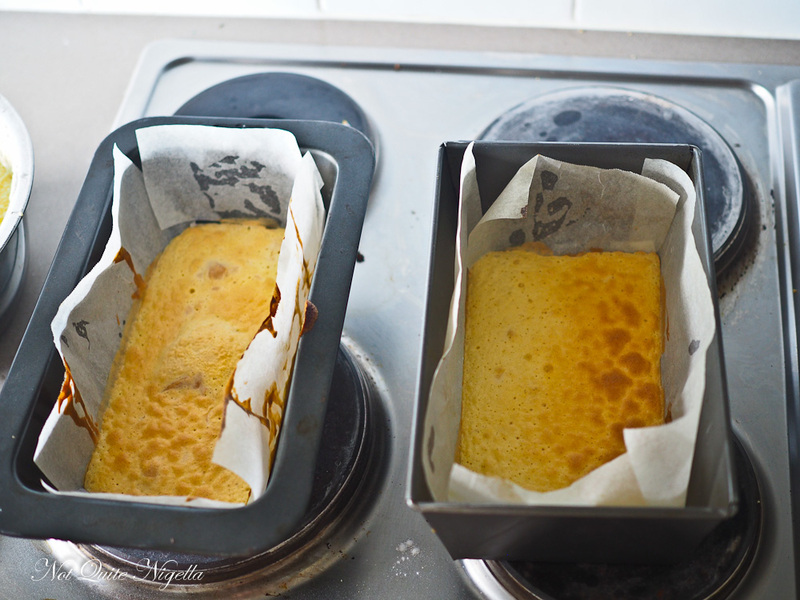 Tip: make two of these cakes (double the above recipe) because if you're waiting by the oven you may as well wait for two! It makes a wonderful gift as it lasts. Step 1 - Preheat oven to 180C/350F and line a loaf tin with parchment. You can also use a grill but do not line the sides of the tin only line the base, just spray the sides well with oil or grease well with butter. Step 2 - Place all ingredients (except the chocolate) in a large bowl and use an electric beater to beat the mixture - start on low and then go to medium speed for 3-4 minutes until it becomes a thick and smooth batter. Step 3 - Spread a thin layer of the batter in the prepared tin making sure that it is even and bake for around 6 minutes (check, the surface should be set and light golden). If you're doing this in the grill it will only take 1 minute. If you get batter drips on the side, wipe it off with a lightly damp cloth as you don't want the browned bits to fall into the cake. 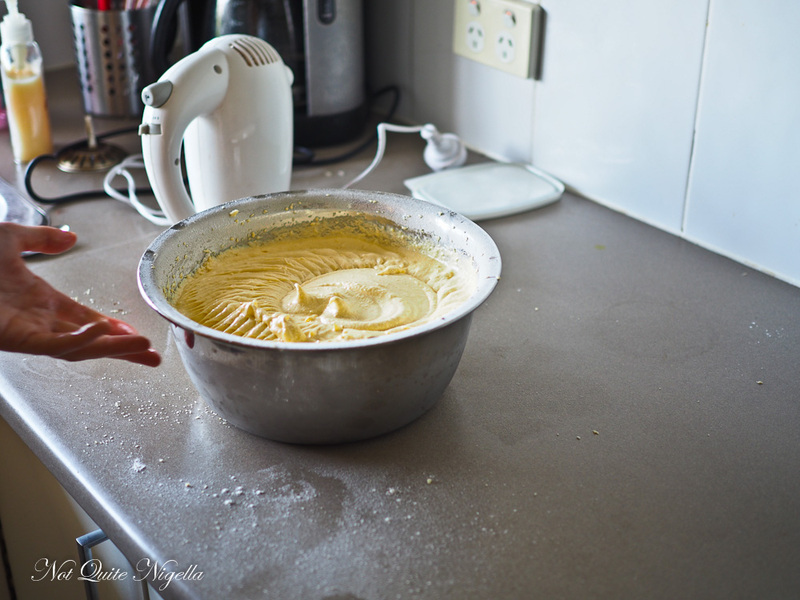 Step 4 - Repeat with the next layer and keep repeating until all the batter is used up and the tin is full. 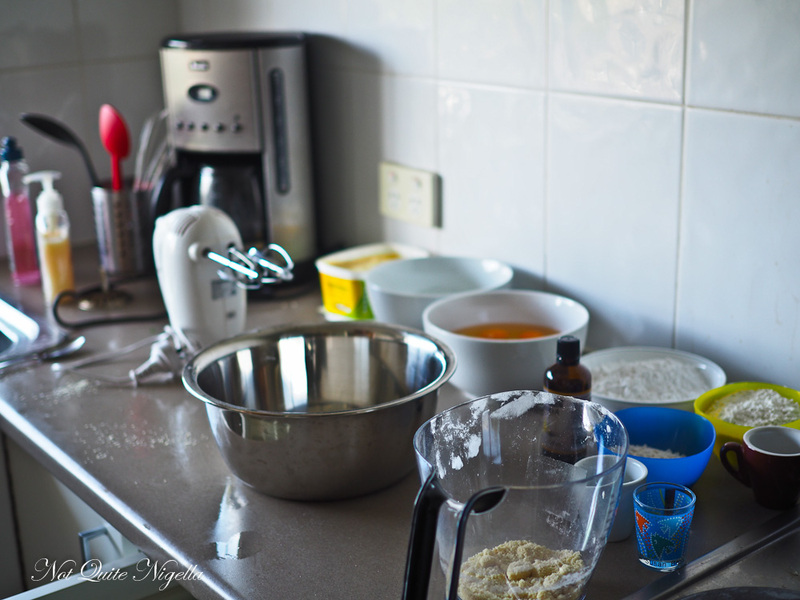 This cake requires patience but it is worth it. Step 5 - When the cake is cool melt the chocolate and stir with the coconut oil. 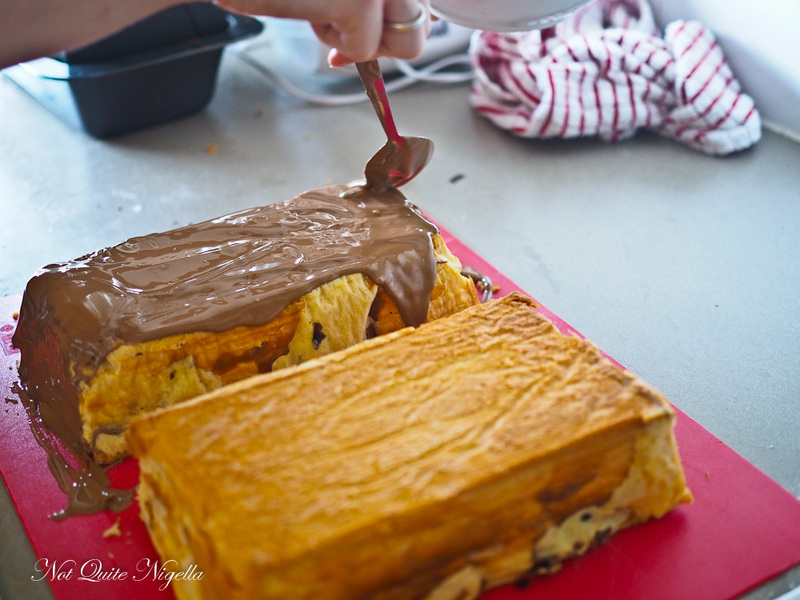 Cover the cake in melted chocolate. I do this twice, once just to get a layer on the outside and then again to make sure that it is thick enough to make the pattern on top (you can do this with a fork). Allow chocolate to set and then slice.